Description Air temperatures remained high with precipitation and river flows below normal, extending the summer’s unusual conditions. South Sound water temperatures were warmer in August — perhaps too warm for coho and Chinook salmon as well as bull kelp. In contrast, Hood Canal, North Sound, and the San Juan Islands provided optimal growth temperatures for herring and salmon. 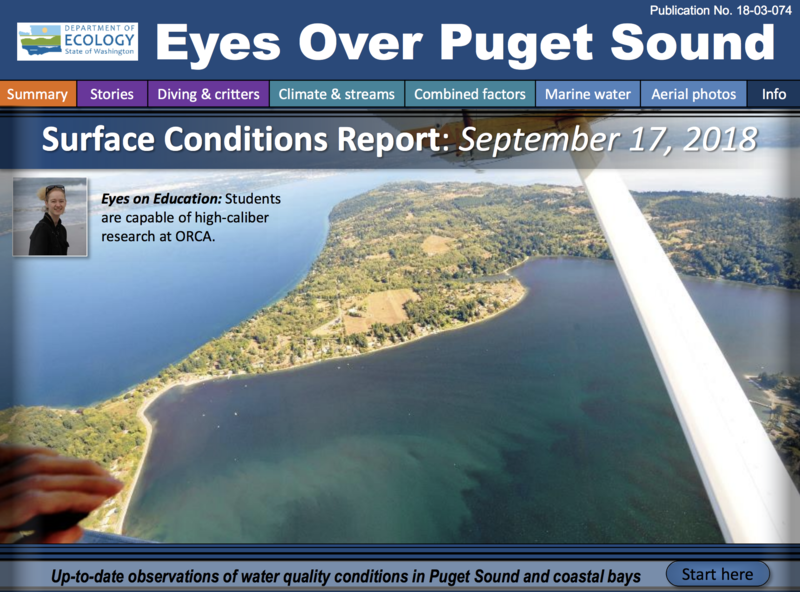 Many terminal inlets of Puget Sound are experiencing extensive red-brown blooms. Jellyfish patches are developing in South Sound finger inlets, and remnants of floating macroalgae occur in the nearshore areas of South Sound and southwest Whidbey Island. At times, floating organic material we see in the air ends up on the shoreline where our BEACH team documents it.